For most people, skateboard length matters and if you like, you can get a board to fit your size. In fact, there are different size boards selling on the market today and you can get one with a span that suits you best. However, just remember to take one that you can handle and you are good for the fun-filled entertainment it provides. Nowadays, manufacturers are making various lengths skateboards so that the buying public can have a number of options to choose from. Take for example; some street boards measure in the range of 7.35 inches to 7.5 inches and these boards are usually a bit narrower than others that are selling on the market. However, for some people who skate on the street, their preference is a 30 inch board. If you are over 6 ft 1 inch tall: You should get a 32.4 inches and over length deck-board. A skateboard width is just as important as its length. The wider your feet are, the wider the board’s width should be. Take for example if you have average feet, your board should fall in the bracket of 7.5 inches to 8 inches. If you have larger feet then you should consider looking at a wider size board to ride on. If you want to do tricks on your slat, you should go for a little smaller board so you can maneuver it better. However, still keep your height and size feet in mind as these play crucial roles in how you develop as an expert skateboard rider. The more flexible your body remains, the better it is for your skating routine. If your body is not flexible enough, you will be putting it through plenty stress that can wear you out in little or no time. Skating can bring the fruit of endurance to your life in a number of ways. Take for example if you tend to fall a lot while you skate, the more you get back up and start over again, is the better your endurance capacity will increase. Since you are not the giving up type, after a while you will begin to succeed in conquering your fear of the board. Skating regularly on your board is a great way to build your body. As you continually use your foot to push you along or to do maneuvers, you are burning away unwanted calories that makes you put on body fat. In no time after you pick up the sport of skating, you will find that your body begins to take on a more attractive look and you will begin to experience greater physical strength. For you to become a good board rider, you have to be able to coordinate the movements of your eyes, feet and hands. Once you can coordinate your body on a deck-board, you will be able to practice proper precision in other areas of your life as well. The same skills you use when riding your board, you can transfer to other sports such as surfing, wakeboarding and snowboarding as well. 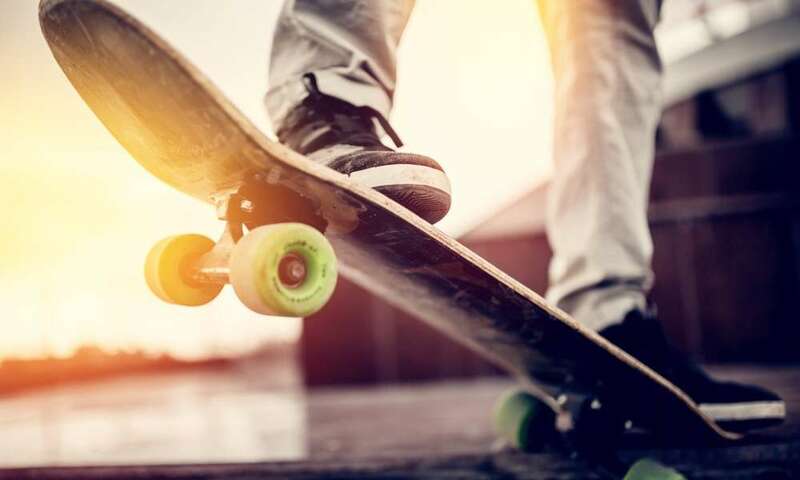 Skateboarding takes plenty balancing to become successful at and once you learn to balance well enough, the other sports that require balancing are no problem for you to handle. Whether you are a beginner or veteran skateboarder, there are times when you have a bad day. Some of those days may involve you taking falls and ending up injuring yourself. Falling once or often from your board when learning to skate can have a negative effect on your self-confidence. Instead of you growing in confidence, you can find yourself weakening from stress instead. skate riding is an enjoyable sport and since it is so loved by many, especially young people, it can become a time consuming activity. If you find your child spending too much time skating and not pursuing other relevant matters in his or her life, you may have to employ some discipline to get him or her to spend quality time in other areas of life such as spending more time doing school work. A skateboard’s length and width are determined by your size and for you to properly master the sport of skateboarding you have to get a board you can easily handle. If the board is not easy to handle because of its bigness or smallness, it will only get in your way and will succeed in making you feel and look clumsy, not to mention causing you injury. You can have a whole lot of fun riding your skateboard and entertaining yourself. It may take you a while to learn to do tricks on your board, but once you get the hang of it all, you can show off your skills anywhere.